Royaume d'Irlande divise en ses quatre Provinces, et subdivise en Comtes. 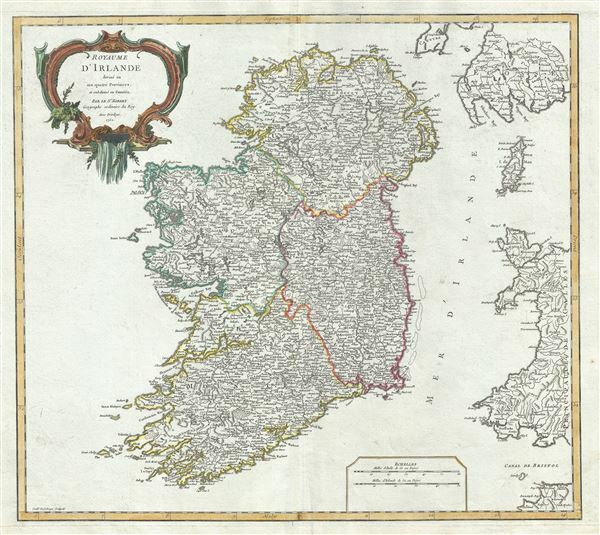 This is a beautiful 1750 map of Ireland by the French cartographer Robert de Vaugondy. It depicts the entire island with county and regional subdivisions defined. It offers excellent detail throughout showing mountains, rivers, forests, swamps, cities and a host of additional topographic features. The whole exhibits considerable accuracy giving ample evidence to Ireland's long cartographic history. Undersea shoals and reefs along the eastern coast of Ireland are also noted. >A beautifully engraved title cartouche adorned the top left quadrant. This map was drawn by Robert de Vaugondy in 1750 and published in the 1757 issue of his Atlas Universal. The Atlas Universal was one of the first atlases based upon actual surveys. Therefore, this map is highly accurate (for the period) and has most contemporary town names correct. Rumsey 3353.018. Pedley, Mary Sponberg Belle et Utile: The Work of the Robert de Vaugondy Family of Mapmakers, 56, state 2.